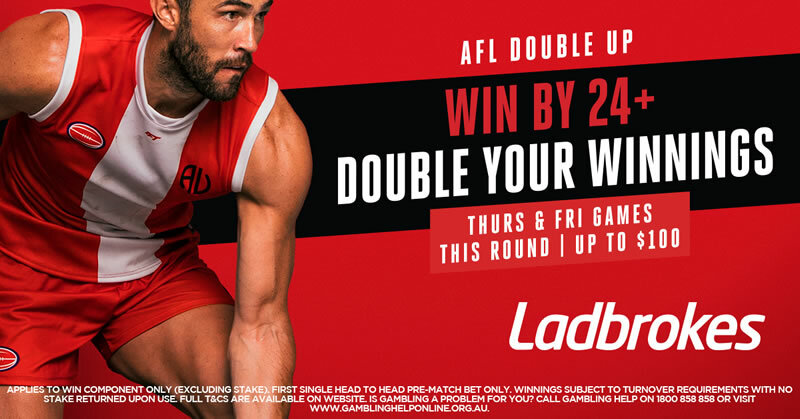 There’s a naughty three game slate on Sunday for Round 3 of the 2019 AFL season.Kicking us off will be the Dogs vs the Suns, followed by the Hawks and the Roos, while the Dockers and Saints will play the twilight fixture. We preview all three matches here and provide our expert betting tips. Good luck to everyone following! Interesting match to kick start Sunday’s action with the undefeated Dogs taking on the 1-1 Suns at Marvel Stadium. The Bulldogs saluted in the corresponding fixture last season, defeating the Suns by nine point at Mars Stadium. The Bulldogs have had a dream start to 2019 with two wins on the board from their opening two games. In Round 1 they were far too strong for the Swans, while in Round 2 they defied the odds to come back against the Hawks thanks to a flurry of late goals. The Suns have also proven a few doubters wrong this season with their fairly strong start to their campaign. They lost their opening round match to the Saints by one point but bounced back with a gutsy home win over the Dockers last weekend. This is a bit of a tough one to kick off the action on Sunday, but we’re inclined to go in favour of the Bulldogs. At first glance the 30.5 line seems rather big, but the Dogs have shown the ability to kick a lot of goals in quick succession, which we believe will be the case in this match en route to a comfortable win and a 3-0 start for the home side. Second up on the Sunday slate we’ve got the 1-1 Hawks taking on the 1-1 Roos. The Roos were dominant in this fixture last season, defeating the Hawks by 28 points at Marvel Stadium. The Hawks looked on their way to a 2-0 start three-quarters through their Round 2 fixture against the Dogs, however, some dubious umpiring decisions and a capitulation on their behalf resulted in them going down by 19 points. On the other hand, the Kangaroos responded the way their supporters had hoped for the most part against the Lions last weekend, however they were simply outgunned and outmanoeuvred in what ended up a 20-point loss at home. Another interesting one to consider here, but we do lean in favour of North Melbourne to cover the spread. They have a big-bodied midfield that can be hard to deal with, which we believe will be the case with the Hawks who will be without Liam Shiels and obviously Tom Mitchell. We see them dominating the clearances and keeping this game close, if not winning it all together. This rounds Sunday twilight fixture features the Dockers hosting the Saints over in Perth. In 2018 it was the Dockers who won this fixture, cruising home by 30 points in front of their fans. The Dockers have shown two different sides in their opening two games. First up they put up a dominant display against the Roos, punishing them by 83 points at Optus Stadium. Many punters had them putting on a similar display second up against the suns, however they fell away late, eventually falling to the suns by one point in a nail-biter. Meanwhile, the saints have defied the odds, clawing to their way to a 2-0 start despite everyone’s expectations. It was questionable whether or not they deserved their one point win against the Suns in the opening round, however, there’s no question ab out their performance in Round 2 when they put the Bombers to the sword by 11 points. Many will fancy the Dockers to bounce back here against the Saints at home, but we will beg to differ. As a rule, the Saints fare well in Perth and will do just that on Sunday against a poor Dockers outfit.